Is El Nio to blame for all these tornadoes? 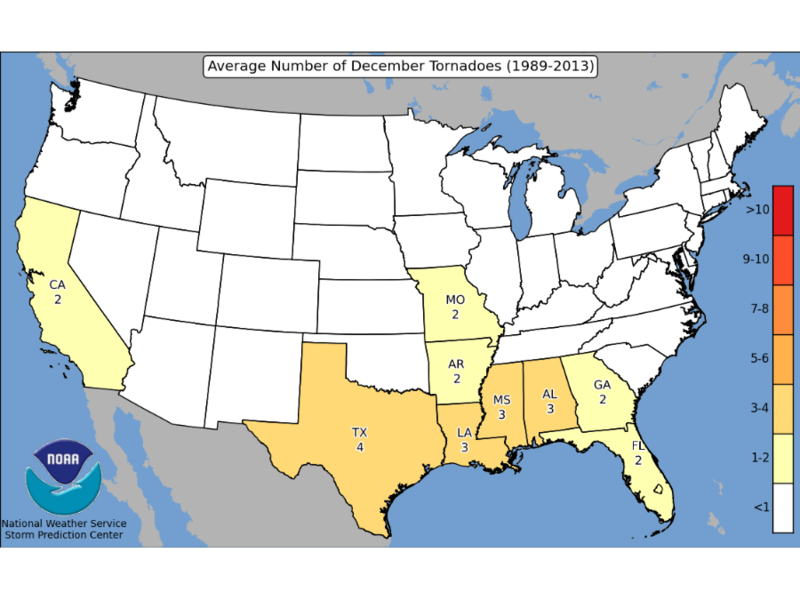 Tornadoes aren't all that common in the month of December. Usually, that's a meteorological phenomenon more closely associated with spring and sometimes late fall. The following map shows just how many tornadoes each state averages each December. The most for a single state during the last month of the year tops out at four in Texas. It makes sense that most of the tornado activity is limited to the South, where warm air air necessary for generating tornadoes continues to linger into the winter. But last week, nearly half the country was experiencing really warm temperatures, and when a front passed through, there was at least one tornado reported every day. While tornadoes in December aren't outside the realm of possibility, seeing this many is a rare feat. The last time this many tornadoes formed this late in the year was 2012. Before that, it was 2002 when nearly 100 tornadoes were spotted. In 2002, there was a moderate El Niño, but in 2012, there was neither an El Niño nor a La Niña in place. The current El Niño is shaping up to be one of the top three strongest in recorded history. With a few other examples in the history books, there is a small correlation between El Niño years and increased tornado activity, especially in the South. 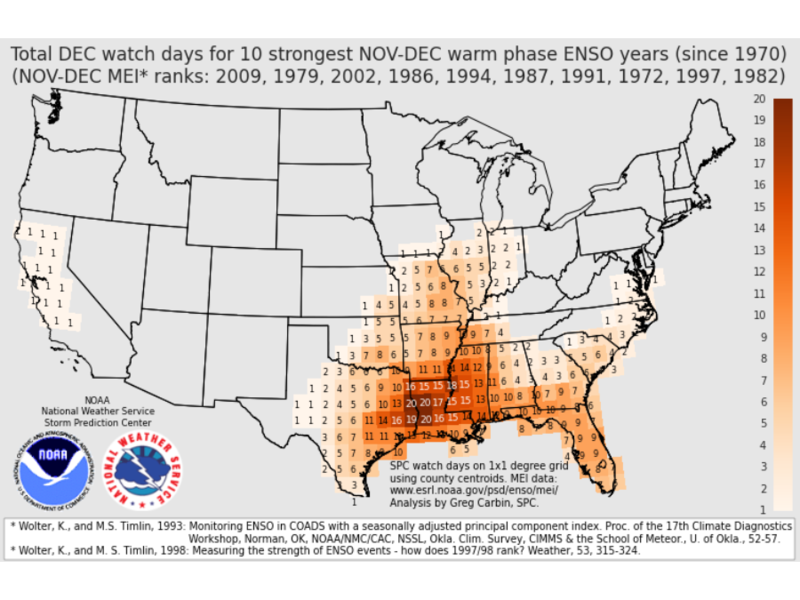 The Storm Prediction Center looked at the number of watches during the ten strongest El Niño years and found there were a lot more than usual in the South, especially in east Texas and Louisiana. The El Niño is ongoing, so we'll have to wait and see how it affects the rest of the winter. So far, it's mostly been warm and stormy unless you're in the Rocky Mountains or the Pacific Northwest.